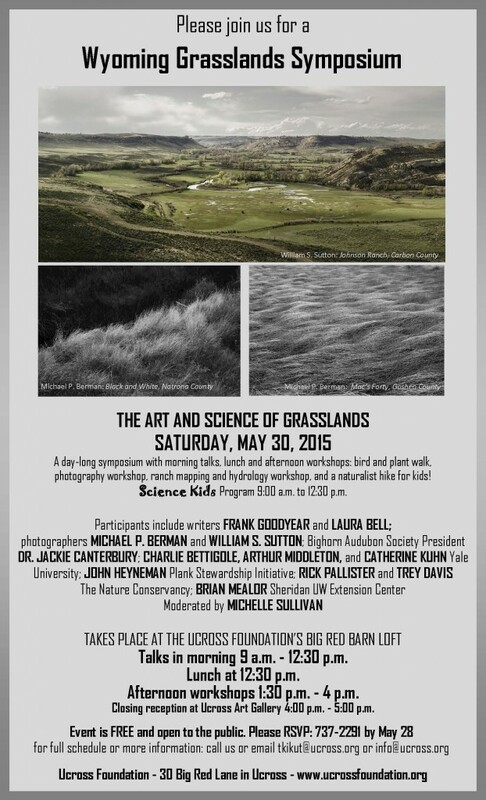 photography workshop, ranch mapping and hydrology workshop, and a naturalist hike for kids! Participants include writers Frank Goodyear and Laura Bell; photographers Michael P. Berman and William S. Sutton; Bighorn Audubon Society President Dr. Jackie Canterbury; Charlie Bettigole, Arthur Middleton, and Catherine Kuhn from Yale University; John heyneman from the Plank Stewardship Initiative; Rick Pallister and Trey Davis from the Nature Conservancy; and Brian Mealor fro mthe Sheridan UW Extension Center. Moderated by Michelle Sullivan. This entry was posted in Grazing, Uncategorized. Bookmark the permalink.